The Elephant Bird (Aepyornis maximus) inhabited the island of Madagascar, off the eastern coast of Africa. Madagascar was settled around 2000 years ago by African and Indonesian peoples. Legends of the giant roc (rukh) in Arab folklore were probably based on the elephant bird. During the 9th century, Saracen and Indian traders visited Madagascar and other parts of the African coast and would have encountered these birds. In 1298, while imprisoned in Genoa, Marco Polo wrote his memoirs, covering 26 years of travel. In chapter 33, "Concerning the Island of Madagascar" he wrote that the Great Khan had sent him to investigate curious reports of giant birds. The Malagasy people had had contact with Arab traders over several centuries, but had fiercely resisted colonisation. The first Europeans to visit the island were the Portuguese in 1500. Dutch and French expeditions established coastal settlements after 1509, penetrating the interior 150 years later. In the 16th century, Dutch, Portuguese and French sailors returned from the Indian Ocean with huge eggs taken as curios. The French established a settlement in 1642, by which time the Elephant Bird had become very rare. The last one probably died in 1649. The first French Governor of Madagascar and Director of the French East India Company, Étienne de Flacourt, wrote, in 1658, "vouropatra - a large bird which haunts the Ampatres and lays eggs like the ostriches; so that the people of these places may not take it, it seeks the most lonely places". In the face of human hunters, the elephant bird was retreating to remoter regions. By 1700, it was gone forever. The elephant bird was the largest bird ever to have lived. 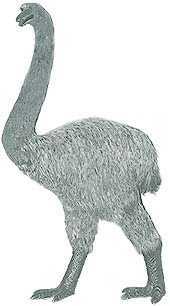 It was a ratite, related to ostriches and emus, though it was unlikely to have been a swift runner. It had massive legs and taloned claws, vestigial wings and a long, powerful neck. Its body was covered in bristling, hair-like feathers, like those of the emu, and its beak resembled a broad-headed spear. It had evolved at a time when birds ruled the earth and had probably existed on Madagascar for 60 million years. In spite of its fearsome appearance (the legendary roc was fierce and ate elephants), it was a herbivore. It had little to fear from other native creatures on Madagascar; it was protected by its huge size and if needs be, could use its feet and heavy beak to protect itself in conflicts with others of its own kind. The birds resembled heavily built ostriches, with small heads, vestigial wings, and long, powerful legs. They stood 10 ft (3 metres) tall and weighed approximately 1000 lbs (455 kg); although some moas were taller, the elephant bird was more robustly built. Their eggs had a circumference of about 3 ft (91 cm), were about 13 inches (33 cm) long and a capacity of 2 imperial gallons (9 litres). This is the equivalent of 200 hen's eggs and three times the size of the eggs of the largest dinosaurs. Fossilised eggs are still found buried on the island. The photo here is of a replica exhibited at Ipswich Museum, Ipswich, Suffolk, UK. The island would have supported only a small, slow-breeding population and the birds were probably driven into extinction by hunting and the theft of their eggs by humans. The fact that it had existed for 60 million years (much longer than humans) and adapted to a changing world, shows it to have been a very successful species. However, it was also specialised to an island environment with no large predators and was, therefore, not adapted to survive contact with aggressive European humans. The number of species living is very small. In all there are only about 12 species known; two, perhaps three species of ostrich in Africa, three cassuary [cassowary] species 1 in southern Asia, two Emu's (Dromaeus) in Australia, an East and a West Australian, three species Rhea in South America, and three or four species of Kiwi (Apteryx) in New Zealand. Among all these the African ostrich, 6 to 7 feet high, is known to be by far the largest and most numerous species. But greater than the number of living species is the number of extinct species, which used to inhabit the islands from Madagascar to New Zealand even within the memory of man; and it is among these that we become acquainted with by far the largest representatives of the family of giant birds. Marco Polo already, in the famous account of his travels, locates the giant bird Rue of the myth upon Madagascar, and relates that the Great Khan of the Tartars having heard of this bird at the far off borders of the celestial empire, sent forthwith messengers to Madagascar. They really brought a feather back with them, 9 spans long, and 2 palms in circumference, at which His Majesty expressed his unfeigned delight. People laughed at this tale, as a fable, and like so many other relations made by Marco Polo on real facts, it was declared vain swaggering talk; - until tidings came establishing the fact, that very recently a gigantic bird was, and is still existing in Madagascar. This happened thus: Natives of Madagascar had come to Mauritius to buy rum; the vessels they had brought with them to hold the liquor were egg-shells, eight times as large as ostrich-eggs, or 135 times the size of a hen-egg; eggs containing 2 gallons. They related that those eggs were now and then found among the reeds, and that the bird also was occasionally seen. This was not believed either until the Museum at Paris in 1851 received such an egg from a landslip in Madagascar, measuring 2 3/4 feet in circumference, and holding 2 1/2 litres; it was in a state as though it had been laid but very recently. Now Marco Polo's fabulous Rue has become the Aepiornis maximus of Madagascar. Yet that colossal egg, the casts of which are exhibited in almost every Museum in Europe, besides some fragments of bones in the British Museum, is all, that has hitherto been obtained of this bird. Whether it still lives, is uncertain. The natives assert to this day, that in the thickest forest, there still exists a giant bird; but that it is very rarely seen. Entry for Roc in Harmsworth Natural History (1910): For a long period the marshes of Madagascar have yielded the egg-shells of enormous extinct birds, in search of which the natives are accustomed to probe with iron rods; the largest of these eggs having a longer circumference of upwards of thirty-six inches, and a girth of thirty inches. From these eggs probably arose the legend of the “roc” of the old Arab voyagers ; and it is, at any rate, convenient to adopt that name as the popular designation for the members of the family Aepyornithidae, all of which are included in the genus Aepyornis. In the course of time naturalists were rewarded by the discovery of the bones of the birds which laid these gigantic eggs; some of these remains indicating a bird of larger build than the most gigantic moa, the metatarsus being especially remarkable for its massiveness. Some of these birds appear to have had four toes, and they all differ from moas in the absence of a bony ridge at the lower end of the tibia. The skull was short and moa-like, and the wing seems to have been completely aborted. 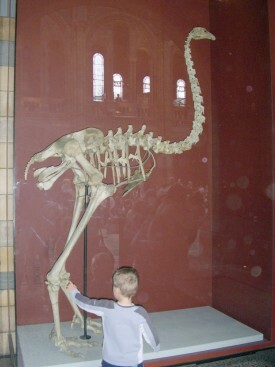 Fossil evidence indicates several other species of elephant bird, ranging from 3 ft (90 cm) to 10 ft (3 metres), had inhabited Madagascar, though most had died out before modern humans had evolved. As well as Aepyornis, one other species, the smaller Mullerornis, probably survived into historic times. The reasons for these birds' extinction are hard to determine as there are no reliable historical records of the pre-European history of Madagascar. They were probably hunted by native people 1000-2000 years before European contact. This was probably subsistence hunting and did not threaten the birds' numbers. Egg collecting by Europeans would have been much more of a threat - such huge eggs can only be laid in small numbers and the birds probably bred slowly. Habitat destruction would have posed a grave threat to such a specialised bird. Another flightless giant island-living bird was the New Zealand giant moa (Dinornis giganteus), a member of the ratite family. 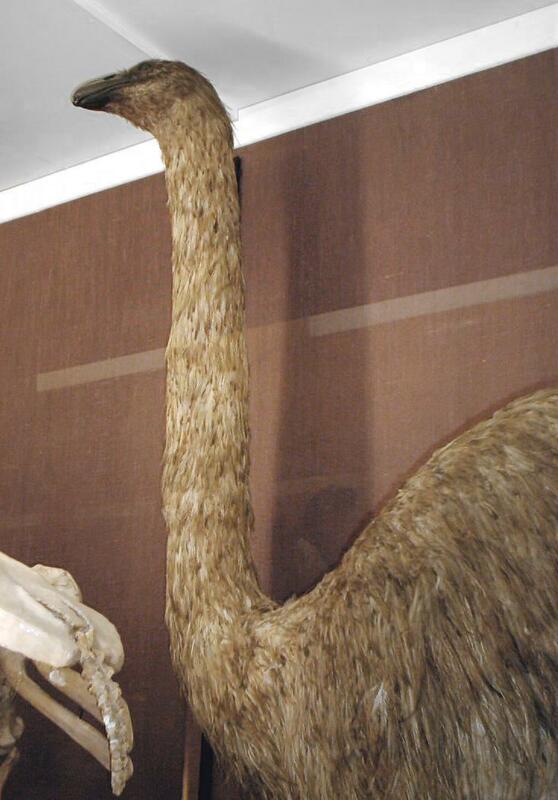 There were several species of moa, some taller than the elephant bird at 7 ft (2 metres) to the middle of the back and 13 ft (4 metres) to the head (twice the height of a tall man), although their necks probably projected forwards like a kiwi rather than upwards as usually depicted. They were more lightly built than the elephant bird, but still three times the weight of a large man at up to 200 - 275 kg. The Giant Moa's eggs measured 10 inches (24 cm) long and 7 inches (18 cm wide). Females were 1.5 times the size and almost 3 times the weight of males, leading scientists the revise moa classification and the number of moa species. In the past, the males and females had been erroneously considered different species due to this size difference. The moas occupied similar niches to mammalian herbivores elsewhere. 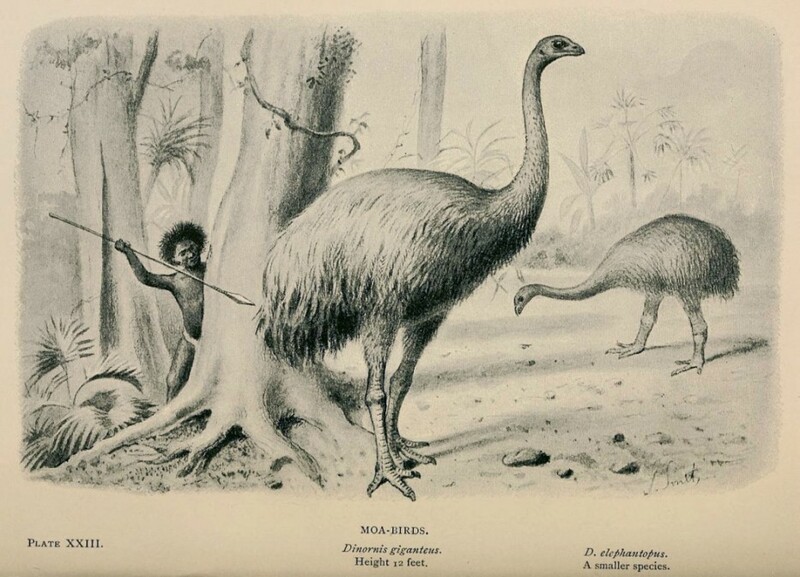 Moas were huge ratite 'running birds' like the Elephant Bird, but they inhabited the grasslands and forest-fringe in extraordinary numbers and variety. Scientists later gave them the family name Dinornithidae, 'terrible birds'. The aggressive Polynesian invaders became a Moa-hunting culture and for the moa, which had had no predators in 100 million years, the effect was devastating. By the time Europeans discovered the islands in 1770, the giant moas had been hunted to extinction; their official extinction date is given as 1773. Europeans did not learn of the moa's existence until bones were discovered in the 1830s. The exact number of species is open to debate, the current belief is that there were 11 species contemporary with man and that higher counts were due to the sexual dimorphism. With only one natural predator large enough to tackle them (Haast's Eagle, another extinct giant) they were the dominant terrestrial species on the islands. Although the giant moa is the species that has captured the modern imagination, other members of the moa family were turkey-sized and weighed little over 1 kg. One striking feature of moa anatomy, apart from its height, is the complete lack of humeri (upper arm-bones). This means they had no trace of wings, not even a vestigial wing-structure. There were several families of moa. Pachyornis and Emeus were hunted to extinction by the Maoris between 1100 and 1500. The powerfully built medium-sized Euryapteryx may have survived until 1700. Pygmy Moas, 3 -4 ft tall (90 - 120 cm) of the genera Anomalopteryx and Megalapteryx died out by 1800, hunted by both Maori and Europeans though there is evidence that one of the pygmy moas may have survived into the 20th century and may possibly still exist in the wilderness of Fiordland. By the time Europeans had realised the significance of the discovery of giant moas, the birds were almost extinct. In 1838, Englishman John Rule brought back a fragment of a huge leg-bone from New Zealand. It was investigated by palaeontologist Richard Owen in London, but even then many dismissed it as a hoax or myth. It took several more years and many more bones to convince naturalists that the moa existed. A consignment of moa bones was sent in 1843 by geologist and missionary, Revd William Williams. He had studied the birds, and had recorded a sighting by two English whalers near Cloudy Bay, in Cook Straits in 1842: "the natives there had mentioned to an Englishman of a whaling party that there was a bird of extraordinary size to be seen only at night on the side of a hill near there; and that he, with the native and a second Englishman, went to the spot; that after waiting some time they saw the creature at some little distance, which they describe as being fourteen or sixteen feet high. One of the men proposed to go nearer and shoot, but his companion was so exceedingly terrified, or perhaps both of them, that they were satisfied with looking at him, when in a little time he took alarm and strode up the mountain." In the 1850s, New Zealand resident, John White, interviewed several sealers who claimed to have eaten moas on the South Island, indicating that some birds had survived until as late as 1850. The most detailed account of giant moas came from an old Maori on South Island, who described the birds' appearance, habitat, feeding and nesting habits. He Maori described how fierce, booming male moas, guarded nesting females. He also described how the birds were hunted and eaten. Another Maori moa hunter described how the moa defended itself by kicking. Their eggs were taken as food and as curios by Europeans. In 1865, a moa egg containing an embryo was discovered near Cromwell. Entry for Moa in Harmsworth Natural History (1910): The fate impending in the case of the kiwis has long since overtaken their gigantic extinct cousins the moas (family Dinornithidae), which had already disappeared from New Zealand when those islands were first colonised from Europe, although there is good reason to believe that they lived on till within the last five hundred or four hundred years, if not to a considerably later date. These birds, of which not only the bones, but in some cases the dried skin, feathers, and egg-shells, as well as the pebbles they were in the habit of swallowing, have been preserved in the superficial deposits of New Zealand, attained a wonderful development in those islands, where they were secure from persecution till man appeared on the scene. Not only did the larger members of the group far exceed the ostrich in size, but they were extraordinarily numerous in species, as they were also in individuals; such a marvellous exuberance of gigantic bird-life being unknown elsewhere on the face of the globe in such a small area. As regards size, the largest moas could have been but little short of 12 feet in height, the tibia being considerably over a yard in length; while the smallest were not larger than a turkey. In reference to their numbers, it may be mentioned that there are some twenty species, arranged in about six genera; and the surface of many parts of the country, as well as bogs and swamps, literally swarmed with their bones. Some of the moas had four toes to the foot, and others three, but all differed from kiwis in having a bony ridge over the groove for the extensor tendons of the tibia. They are, therefore, evidently the least specialised members of the order yet mentioned, seeing that this bridge is present in the majority of flying birds, and has evidently been lost in all the existing Ratitae. While agreeing in some parts of their organisation with kiwis, moas are distinguished by the short beak and the presence of after-shafts to the feathers while in the larger forms, at any rate, not only was the wing, but likewise the whole shoulder-girdle, wanting. There is, however, reason to believe that certain pigmy moas - which from their size were evidently the most generalised members of the group - retained some of the bones connected with the wing. Moas were represented by several very distinct structural modifications; the largest being the long-legged, or true, moas (Dinornis) , characterised by the long and comparatively slender leg-bones, and also the large and depressed skulls. In marked contrast to these were the short-legged, or elephant-footed, moas (Pachyornis), in which the limb-bones are remarkable for their short and massive form; the metatarsus being most especially noteworthy in this respect. In these birds the skull is vaulted and the beak narrow and sharp; but in the somewhat smaller and less stoutly-limbed-broad-billed moas (Emeus) it is broad, blunt, and rounded. The other species, in all of which the beak was sharp and narrow, are of relatively small stature, and include the smallest representatives of the family, some of which were less than a yard in height. The eggs of the moas were of a pale green colour, and probably formed a favourite food of the Maori, by whom these birds wcre evidently exterminated. Several skeletons are on display in museums in New Zealand and Europe and there are models and reconstructions based on these skeletons, on naturally preserved feathers and on oral tales of the bird and on its smaller relative, the kiwi. It is believed that moas resembled kiwis in several ways, that they were communal living and that the eggs were brooded by the males. With no need to look out for predators, their heads were probably carried forwards, like the kiwi, rather than upwards like an ostrich. 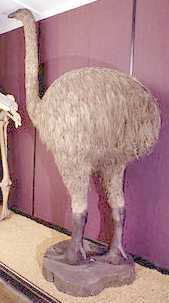 Another island giant, the Tasmanian emu, has been extinct since the 1850s on Tasmania and since the 1830s on Kangaroo Island (a 90 mile x 35 mile island; 144 km x 56 km). Unlike New Zealand, Australia had a variety of marsupial mammals and birds did not become the dominant life form. The Tasmanian emu was smaller than the Australian emu and was extinct by 1850. 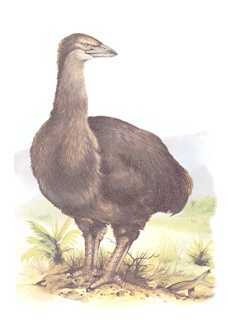 The Tasmanian dwarf emu was wiped out by 1830. Both were wiped out by man and by bush fires started by man. Kangaroo Island was discovered in 1802 and settled by whalers and sealers. Its emus were wiped out within 30 years. Australian emus survive on the Australian mainland in spite of extensive hunting between the 1920s and 1940s. 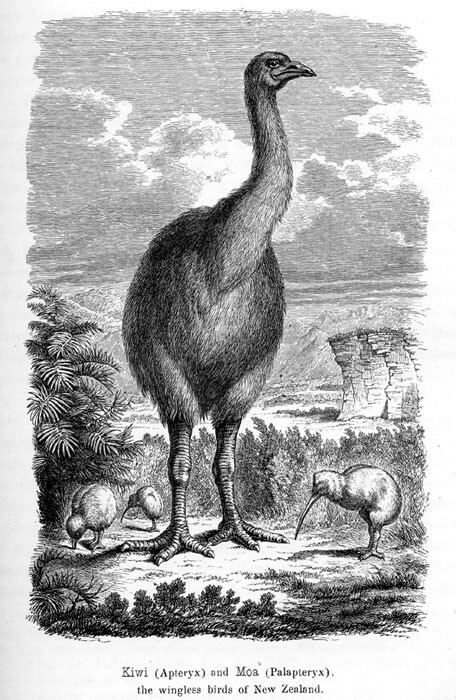 In 1867, Ferdinand von Hochstetter's book "New Zealand" described the Moa at length in Chapter IX "Kiwi and Moa, the wingless Birds of New Zealand". Below are excerpts describing the birds and their extermination. The Kiwi, however, is only the last and rather insignificant representative of the family of wingless birds that inhabited New Zealand in bygone ages. By the term "Moa" the natives signify a family of birds, that we know merely from bones and skeletons, a family of real giant-birds compared with the little Apterygides. Missionaries were the first that beared from the natives of those gigantic birds, against which the ancestors of the present Maoris had been engaged in fearful struggles. The natives even pointed out a Totara tree on Lake Rotorua as the place, where their ancestors slew the last Moa, and in order to corroborate the truth of their narrative they showed large bones, which they found scattered on the banks of rivers, on the sea-coast, in swamps and limestone-caves, as the remains of those extinct giant-birds. In 1839, Mr. Rule brought to England a fragment of a thigh bone of a Moa, from which Professor Richard Owen drew up a wonderfully correct idea of the bird. Almost at the same time the Rev. 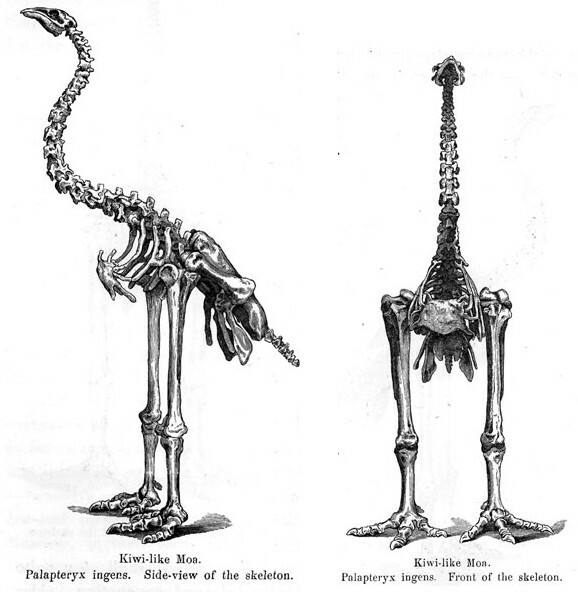 Mr. Colenso described in the Tasmanian Journal Moa-bones as the remains of gigantic birds. These facts excited interest and caused fresh researches, in consequence of which the Missionary, the Rev. W. Williams in 1842 sent several chests full of such bones, - which had been gathered on North Island in the coast districts about Poverty Bay and Hawkes' Bay, - to Dr. Buckland. Dr. Buckland presented the treasures to the Museum of the Royal College of Surgeons, and Prof. Owen constructed out of them the gigantic legs of Dinornis giganteus, which are one of the greatest curiosities of said Museum, legs over 5 feet high, which intimate a bird of at least 9 and a half feet in height. This is by far the most colossal from all the birds known. The tibia, the shin-bone alone, measures 2 feet 10 inches. Upon South Island it was Mr. Percy Earl and Dr. Mackellar, who made collections at the mouth of the Waikouaiti, North of the Otago peninsula. But by far the most copious harvest was that gathered by Mr. Walther Mantell in the years 1847-1850 upon North and South Islands. He had collected more than 1000 separate bones and also fragments of eggs, which were bought by the British Museum, and furnished Prof. Owen the rich material for this celebrated works on the extinct families of Dinornis and Palapteryx. In this collection there was the famous skeleton of the elephant-footed Moa (Dinornis elephantopus) from Ruamoa, three; miles South of Oamaru Point (First Rocky Head), Province Otago, a species, which while it fell far short of the height of Dinornis giganteus, - measuring hardly over 5 feet, - was distinguished by an extraordinarily massive construction of the bones, and, as Mr. Owen says and indicates by the nomenclature, of all birds represents most the type of the pachyderms. Very appropriately, therefore, this skeleton has been placed in the British Museum by the side of the gigantic elephant Mastodon ohioticus. Colonel Wakefield, Dr. Thomson and many others have also made up collections partly on North, and partly on South Island, and according to Prof. Owen there are already 12 to 14 different species of Moas known. Most of them have three toes like the Australian Emu. These Prof. Owen classes with the genus Dinornis, the four-toed species with the genus Palapteryx. From smaller bones, which were found, the genus Aptornis was established. However, the whole family of those wingless birds seems to have been very variable, since nearly every individual found, varied not only in size, but also in the number and proportion of the bones (especially of the vertebrae). It is, therefore, very doubtful, whether all the species, distinguished by Prof. Owen, are good species. 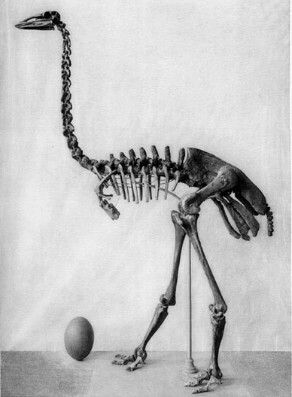 Besides bones, there were also fragments of egg-shells found on North and South Islands, indicating eggs of a size much larger than ostrich-eggs, but not quite equal in size to the egg of Aepiornis maximus [Elephant Bird], and of a thin shell with linear furrows. 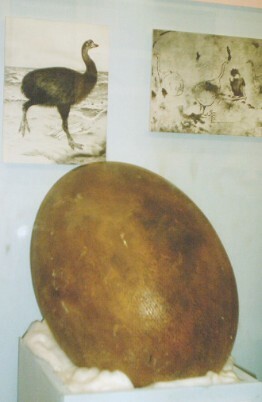 In 1865, Mr. J. C. Stevens, Natural History Agent in London, received from New Zealand an almost perfect egg of Dinornis. The egg is about ten inches in length and seven inches in breadth, the shell being of a dirty brownish colour, and about 1/12th of an inch in thickness. [...] Besides bones and eggs, little heaps of small rounded stones are very frequently found, generally chalcedony, carnelions, opals, and achates, which are designated by the natives as "Moa stones". They are sometimes found together with Moa skeletons, partly also in places, where there are no traces of Moa bones. It is probably correct to suppose that those stones come from the stomach of the birds, which like the ostrich and the Australian Emu were in the habit of swallowing little stones to assist digestion, ejecting them again from time to time, in order to swallow others less rounded. From the localities of Moa bones, hitherto discovered, it appears first, that those birds were distributed over North Island, as well as South Island. Yet, as the Apteryx species of the two islands are different, so also the Moa species of North Island seem to be different from those found on South Island. Cook Strait, now separating the two islands, may have proved to these birds, which could neither fly nor swim, an unsurmountable obstacle, preventing them from migrating from one island to the other. New Zealand was perhaps a large continent when the Moas were first created. And if we suppose this or at least that the two islands were formerly contiguous to each other, we of course suppose also, that the separation took place so long a time ago, that the originally identical species, after the separation of both islands, may have been changed in course of time into the present varieties or species. According to Prof. Owen, the birds of South Island present stouter proportions, a compact, rather bulky frame of body, such as Dinornis robustus, elephantopus, crassus, and Palapteryx ingens, while those of North Island are distinguished by more slender and lengthy forms, like the Dinornis giganteus and gracilis. These various species inhabited the plains and valleys and had their hiding-places in forests and caves. Their food doubtless consisted of vegetables, especially fern-roots, which they dug up with their powerful feet and claws. To assist the process of digestion, they swallowed small pebbles. According to native tradition, Moas were decked with gaudy plumage; and the present New Zealanders describe a cochin-china fowl as what they conceive lo have been the shape and the appearance of Moas. The formation of the skull leads us to infer, that they were stupid, clumsy birds, which we must not suppose to have been swift runners like the ostrich, but sluggish diggers of the ground, the nature and habits of which demanded no larger scope, than such as the limited territory of New Zealand presented. From the traditions of the natives it appears, that great numbers of Moas were still living upon the islands at the time when they were first populated, and that the last of those birds probably disappeared from the surface of the earth but a few generations ago. It is even rumoured in the colony and is certainly not utterly impossible, that in unaccessible solitudes there might still be some few living stragglers of that giant-family "the last of the Mohicans". However, I am not inclined to believe the stories of the natives, that Heretaunga in the vicinity of Ahuriri on the East Coast of North Island or Whakapunake on Poverty Bay is the haunt of the last living Moas; and I likewise discredit the assertions of American sailors and seal-hunters, who pretend to have seen monster-birds of 14 or 16 and even of 20 feet in height stalking to and fro on Cloudy Bay and on the inhospitable southwestern shores of South Island. And certainly it is a remarkable fact, that in those extensive, wholly uninhabited regions of the Southern Alps, which within the last years have been explored, no reliable traces could be found anywhere. It is therefore my opinion, that all the larger species are wholly extinct, and that the above mentioned Roa-roa (Apteryx maxima) is probably the largest living representative of the former giant-family. To the question about the causes of the dying out of those gigantic birds, we must necessarily connect the question about the causes of the final extermination of other large animals of the present period. [...] There are many facts, showing that in the struggle for existence, man acts the main part; that man has already swept quite a number of species from the surface of the earth, and that it is chiefly the largest animals that first succumb. We may even say, that all the larger animals are gradually being exterminated excepting those, which as domestic animals save their existence merely by their absolute dependence on man. The reasons for this arc quite obvious. The animal is either useful or noxious to man. If it be a large animal, its useful or noxious qualities are the greater; and in both cases man will strive to kill the beast, either in order to secure to himself the benefits of it, or to avert the great damage. This struggle of extermination will last a longer or shorter time, according to the number of individuals engaged, or, - since in the case of large animals, it can be only comparatively small upon a given space, - in proportion to the greater or smaller area of distribution of the animals in question. The huge animals once populating the forests of Europe, furnish a great many examples and proofs, too well known to require any further explanation. I will mention only two facts to show, how rapidly often the struggle is brought to a close with species having only a very limited range of distribution, how little there remains of such animals exterminated by the hand of man, and how fast every thing relating thereto is forgotten. [...]Nor is it to be doubted, that the extermination of the gigantic birds of New Zealand was chiefly accomplished by the hand of man. In briefly retracing the past to the times when New Zealand was not yet trodden by the foot of man, we must assume, that at that time the large Dinornis and Apteryx species, whose bones we find to-day, lived in great numbers upon open fern-land, subsisting on the roots of Pteris esculenta. Dr. J. Haast notices also the occurrence of bones of the Dinornis in the moraines of the glaciers of South Island, and observes that the present Alpine flora furnished a large quantity of nutritious food quite capable of sustaining the life even of so large a creature; and as the fruits of these plants seem at present to serve no evident purpose in the economy of nature, he argued the former existence of an adequate amount of animal life, to prevent an excessive development of vegetation. This part was played by the Dinornis. Those huge birds were then the only large animal beings that populated New Zealand; for of indigenous mammalia, except a little rat, there is nothing known. The first immigrants, who throughout the whole length and breadth of the extensive forests found nothing for man to subsist on, except the native rat and some small birds, obtained from the giant-birds the necessary supplies of meat, enabling them to increase in course of time to a whole nation numbering hundreds of thousands. But for those colossal birds, it would be indeed utterly impossible to comprehend, how 200,000 or 300,000 human beings could have lived in New Zealand, a country which even in its vegetable world offered nothing for subsistence, except fern-roots. That such was really the case is sufficiently proven in the traditions of the natives. Ngahue, one of the discoverers of New Zealand, -- so tradition says, -- describes the land as the haunt of colossal birds. There are yet some Maori poems extant, in which the father gives his son instructions how to behave in the contests with the Moas, how to hunt and kill them. The feasts are described, which were wont to be instituted after a successful chase. Mr. Cormack as well as Mr. Mantell have found the bones on both the North and the South Islands in great number in the vicinity of camping-grounds and fire-places of the natives. Mounds were found full of such bones, in which after great feasts the remnants of the meals were promiscuously interred. The flesh and eggs were eaten; the feathers were employed as ornament for the hair; the skulls were used for holding tattooing powder; the bones were converted into fish-hooks, and the colossal eggs were buried with the dead as provision during their long last journey to the lower regions. Consequently those huge birds were in former times the principal game of the natives, and were probably altogether exterminated in the course of a few centuries. Footnote: Dr. Thomson believes, that the Moas have become extinct since the middle of the 17th century. Meurant, a seal-hunter, according to a communication of the Rev. Mr. Taylor (New Zealand Magaz., April 1850), asserts his having seen Moa bones with the flesh on in Molyneux Harbour, South Island, as late as 1823. At any rate, natural phenomena such as volcanic eruptions, conflagrations of woods and heaths are likewise very probable to have contributed to the diminishing of the Moa family. 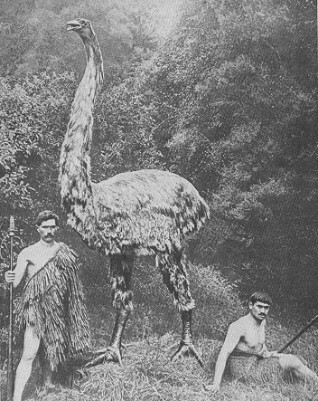 In the swamp near Waikouaiti in South Island, Moa feet and legs have been found in an erect position, and the extraordinary number of Moa bones found in swamps is probably to be explained in this manner, that large flocks of those birds driven by fire or by men, got lost in the swamps and perished there. Dr. Haast very recently had the good fortune to make a most extraordinary discovery of that kind. A swamp near the Glenmark home station (Province Canterbury) has long been celebrated for the quantity of Moa bones that have been found there. Dr. Haast found no less than twenty-five skeletons of the Dinornis elephantopus and Dinornis crassus, of different ages. The bones were in excellent preservation and perfect condition. They retain the usual proportion of animal matter, and have undergone no mineral change. It is evident from these and similar discoveries that the birds of the elephantopus and crassus species congregated together in flocks, while the more monstrous specimen known as Dinornis giganteus must have been a comparatively solitary bird, as the bones of this class are scarce, and never found in any numbers in one spot.